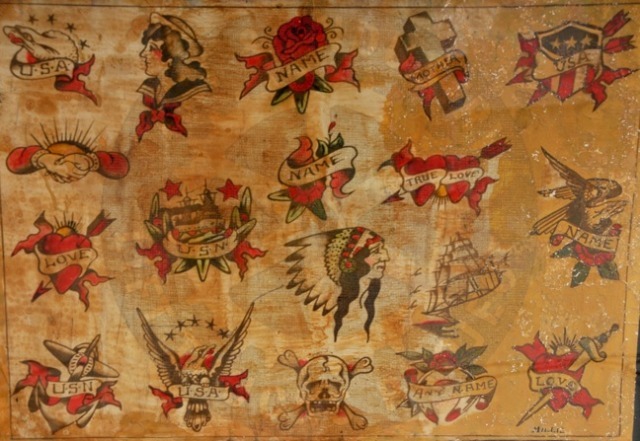 America's Tattoo Master, Mr. Samuel F. O'Reilly, trained Ed Smith along with Charles Wagner in the 20's and 30's on the Bowery in New York City. Bums, empty bottles and the elevated train ran the streets back then. The idea probably serves as a reminder for us to keep the faith, no matter what. Kind of the like that 'Hang in there Baby' cat poster you always see in dentists offices. A lot of us would rather have Rock of Ages tattooed on our backs than ever see that poster again. 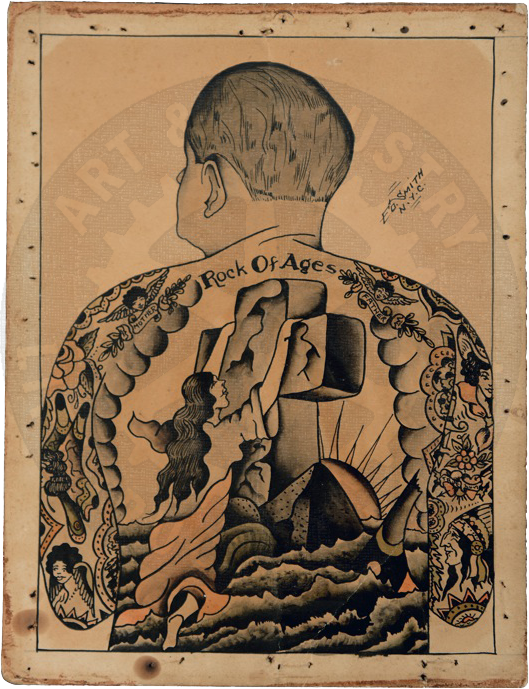 As a symbol "...'Rock of Ages' which, as is well known, protects the tar from all general mishaps..." From Tattoo, Secrets of a Strange Art as Practiced Among the Natives of the United States, Albert Parry, 1933. Looks like Ed had fun with this one. 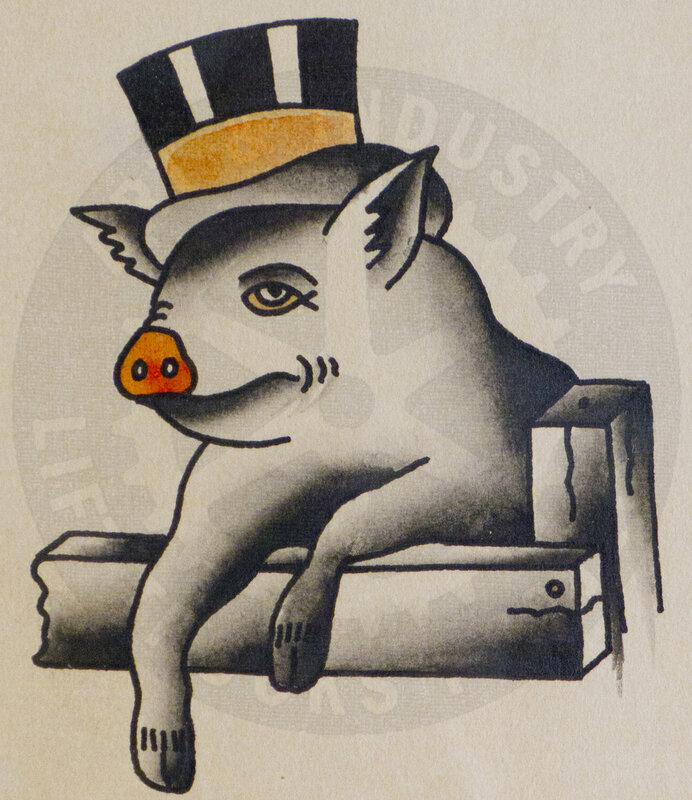 His most cool version of the classic, almost pagan, symbol of non-drowning; a pig. Usually tattooed on a sailors instep of the left foot, because, as everyone knows, the rooster goes on the right. These are the two animals that can not swim. It's a form of reverse good luck, like Born to Lose for bikers or Break a Leg for the theater crowd. Wearing this symbol not only acknowledges the danger but controls the luck. Ed Smith went into commercial production with designs of some of his most popular images. Many thanks to Cliff White's good eye as he spotted this correctly as an Ed Smith design even though it's signed "Millie." She may have colored and re-inked parts of it as they worked closely together on the Bowery. This sheet looks like it's been through the ringer but it's a survivor. Not many are still around actually signed by legendary Mildred Hull.